How big is baby? I'm not entirely sure what an Acorn Squash is, but I'll go small pumpkin-ish? Sleep: The trimester of the pillow fortress has begun... pillows everywhere, and not a lot of rest. Symptoms: The usual burn. Ribs and back. Peeing like a racehorse. Best moment of this week: I turned 32 today, and realised that by my next birthday, I'll be a Mum to 2 beautiful little girls. Considering we thought our journey was over, it's mind-blowing. We also toured our new hospital to get more of an understanding of where things are, for when the time comes. Miss anything: Being able to use the bathroom on the odd occasion, rather than every hour. Movement: The kicks have gone back down to my crotch again - so I'm paranoid that she has flipped yet again. Food cravings: Cookies. All the cookies. Anything making you queasy or sick: Cleaning up 3y/o puke in the middle of the night... barf. How's your mood? I'm doing okay. Sore and starting to count down, which is a bit surreal. The Bump: Not too different from last week! This entry was posted on 15:55 and is filed under IVF , Pregnancy #5 , week-by-week . You can follow any responses to this entry through the RSS 2.0 feed. You can leave a response, or trackback from your own site. 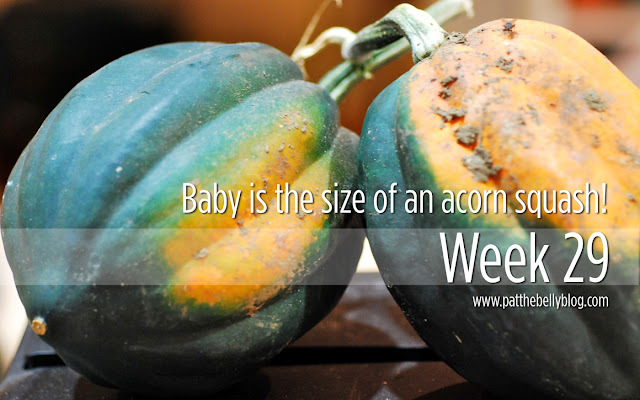 Acorn squash are yummy! Getting close now! GTT Results & a Big Ol' Flip!